The right disguise can get you out of some sticky wickets. A few years ago, in a review written about this very same franchise, the J Man asked an interesting question: is it possible to dislike a game for what it isn’t? 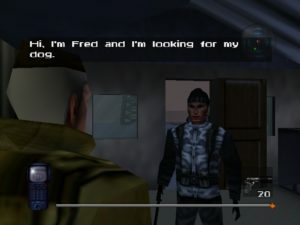 Eight years after that particular game was released, Ocean released this incarnation based on the Tom Cruise movie, that 10-year-old Uncle Dave had been quite excited for, thanks to a couple of previews in Nintendo Power that basically hyped the game to be a proto-Hitman, a more non-linear game with multiple solutions to objectives that would require players to outfox their enemies and work as a team, instead of your basic action game. Finally, after months and months of waiting, Young Uncle Dave got his hands on a copy, ready to sneak, cajole, and disguise my way across the world…and instead…we got…another average-to-above-average action game…which brings up a follow-up to J Man’s original premise: Is it wrong to dislike a game for what it isn’t that you were specifically told it would be? Now, before I bag on Ocean for pulling a bait-and-switch, I do want to point out that what we did get is a fairly good game with some exciting moments and some innovative features. You play, mainly, as Ethan Hunt, following the general plot of the film, going from crack IMF agent to disavowed after a mission at the Russian Embassy in Prague is sabotaged by a mole, and then launching a heist against CIA headquarters to lure the traitor out in the open. There’s also a B-plot of sorts pitting you and your team against a Russian arms dealer in the Arctic, but it mainly serves to bookend the main story and flesh out the length of the game a bit. Shootouts on top of a moving train with helicopters around? Impossible, you say? 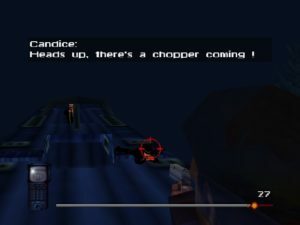 The majority of the game is played out in a third-person perspective, mostly spent looking for important items or speaking to NPC’s to find those items, most of which are tagged on an on-screen radar, color-coded to differentiate between people, places or objects. The controls are mostly smooth, but the inventory system is separated into “weapons”, cycled by B, and “items”, cycled by Bottom C, which is clunky at first, but not unworkable, especially since neither group will ever be particularly large, at most, you’ll carry roughly two or three weapons and three or four items at most per stage. A serves as your action button, and is context sensitive, jumping, opening doors, speaking to others, and receiving messages. It’s also worth noting that this isn’t always a run-and-gun shootout waiting to happen. 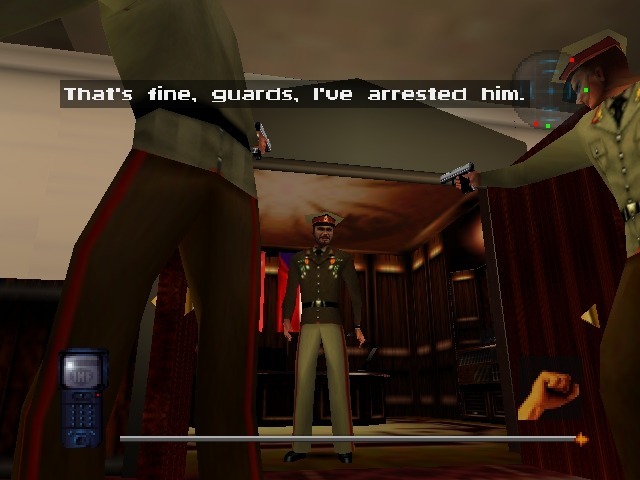 There are quite a few stages where you’ll be shooting your way from objective to objective, but other times, you’ll either be unarmed, or put into a situation where whipping out a gun will cause you way more harm than good, either in the form of critical NPC’s turning guns on you or arresting you…yes…you read that right. Arresting you. There are situations in the game where enemies have the power to make you put your hands up and surrender, regardless of your health, and regardless of whether or not you’re holding a gun yourself…it’s a bit strange, to say the least, and lends itself to some unintentionally hilarious moments, but it does serve to remind you that you are meant to get in and get out without raising too much of a stink in the process. …I don’t think he’s buying the story, Ethan. …And in that last paragraph lies most of my disappointment with what Mission: Impossible turned out to be. We were promised a wide-open experience, unlike anything we’d ever seen or played before, where creative problem solving was the order of the day…but, instead, we got a rather linear action game with a handful of wrinkles and the name of a successful movie behind it…however, if you went into this without crazy high expectations like I had, you’d probably at least have a bit of fun with it, and most likely wouldn’t notice most of the problems with it, unless you were looking. Ultimately, despite the wide gap between expectations and reality, it’s not a terrible game, and in the fifteen years since its release, I’ve made my peace with it and learned to appreciate it for what it is. Can be innovative at times, enough variety of gameplay to not get terribly bogged down. Not nearly as innovative as what we were promised, graphics and sound feel very much unfinished. I remember being so very disappointed by this one. 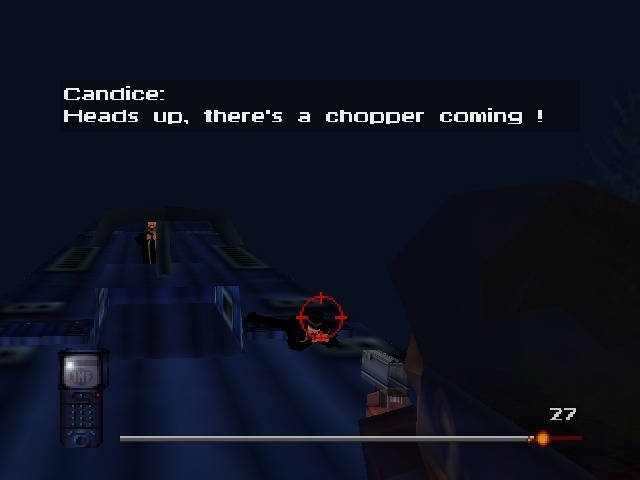 Mostly with the awkward, floaty, third person shooting that may or may not have become a greater focus after Goldeneye. There were some clever moments, and the disguise system was the right amount of fun, but yeah, “unfinished” seems the best way to describe the whole package. w00t, a shoutout! This may be the first time that my screen name’s origin (an intentional double-misspelling of Mr. Kommunist Manifesto himself) has come up in context. Awesome. I had never gotten around to finishing this game, last time I played it was when I was probably 13. I remember it being frustrating and nothing really like the movie. If it were cleaned up a bit and called a different name, then maybe it would’ve worked better. Not a terrible game by any means but yeah, a little disappointed. This game was a bit of a development disaster. I have a magazine somewhere with an interview of the french team that picked up the pieces. The first team that worked on it was in the USA if I remember correctly. They failed to make any real progress. Lofty goals including super fancy AI and hopelessly complex graphics assets that could never work on N64 itself. Some of the early screenshots show the original concept models/scenes that were far beyond N64’s capabilities. Am yet to finish the ending bookend missions. But once I got into the game I loved it! Had the feel of mission impossible the TV shows and the first movie its based on. Loved that shooting was part of it but not all it was about rather shooting was one more tool in your arsenal. Though some levels while cool (the train levels) should have had even more of that mission impossible feel rather then so much of a James Bond Goldeneye style mixed in. After all this is supposed to be more realistic and its own thing. Still a great game. Wow that embassy mission was just awesome especially back in the day.